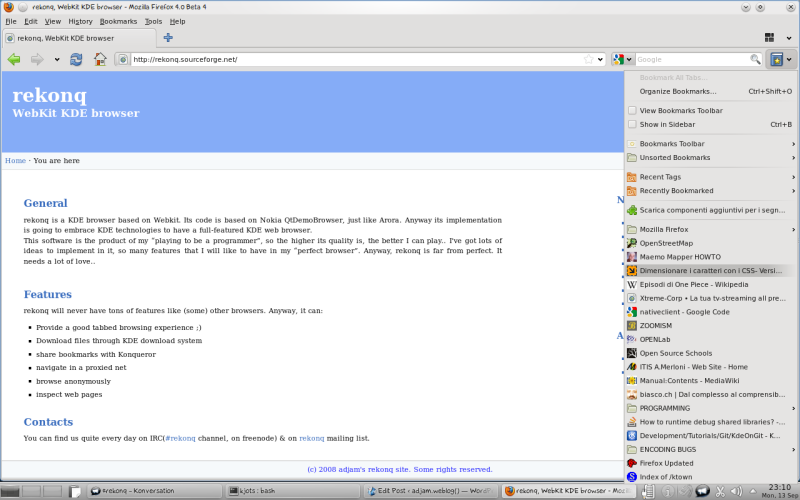 rekonq 0.6, firefox 4.0b4, download_i18n. Not really more to say about, just a little link to our poor website (volunteers to help?) where you can find the tarballs. Last thing: some days ago someone in IRC (cannot remember who and I’m too lazy now to read logs..) asked me about a script we use to download i18n strings. The script is in our scripts/ dir and it is called “download_i18n”. it is really a rude bash script, but it automatically download all po files for rekonq, rename them accordingly to the code language (eg: rekonq_it.po) and check if the translated strings are more than 80% of the total. It worked here for our release. But if you are a packager and you wanna use it, do it at your own risk!! Great! Glad to see the release. I apologize if this has already been answered, but are there any plans to upstream the back/forward button support so the rest of KDE can make use of it (or is that even feasible)? This is one of the most-wanted and oldest feature requests in all of KDE. I mean the back/forward mouse buttons, which at least for me rekonq support but the rest of KDE does not. Sorry. Updating it and also my RELEASE_HOWTO_LIST..
@ gdebure, Yiannis, Warren Dumortier: it will be fantastic having your help about. Just come in our mailing list (rekonq@kde.org) with a sort of proposal about the site, explaining also the requirements. I shortage to separate here your website reinforce with the superfluity of information stick serving providers like you. yes, you made some good points there. I did a search on the topic and found most people don´t realy trouble about it.